Are you looking for a stand-out WordPress church theme that offers much more than the usual design elements? Well, look no more. This new premium church WordPress layout features a custom, textured, grunge-oriented design scheme, along with user-friendly functionality that will make the right impact on your congregation's website visitors. 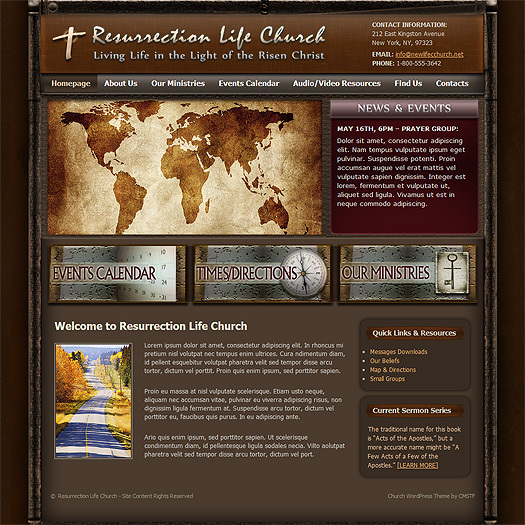 Colored in rich, deep earth tones, this WordPress theme for churches is a website to awaken the senses. Both the color and graphic design elements help this particular church website to stand out from the majority of the Web. In addition to bold, eye-catching graphics, this WordPress church website also offers powerful, interactive functionality - including an editable slideshow, News and Events display section, multi-level drop menu and more. And of course, all of this is designed to work seamlessly with the powerful, flexible WordPress content managements system. This all adds up to a powerful, affordable, impacting church website choice for your community.